Probably one of the hardest things about divorce is that people move on and develop new relationships. Often, I hear from clients that they can’t stand the new girlfriend or boyfriend. They do not want to have their children around the new love interest. They worry about confusing their children or about being replaced. 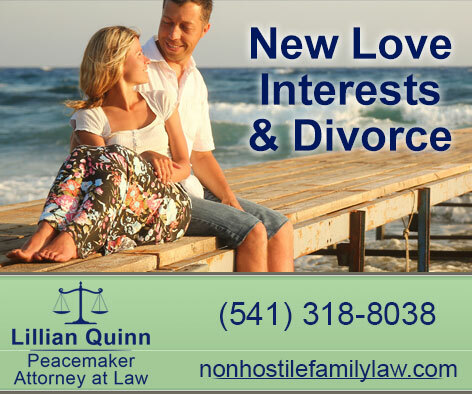 Prior to divorce, Central Oregon families are typically active both indoors and out, together as a family unit and new love interests often first appear here following the divorce. Whatever your circumstance, in divorce, family law in the State of Oregon, typically allows the parents to determine who their children spend time with during their own parenting time. The only way a Family Law Attorney may pursue an order of the Court preventing anyone from seeing your children is if a person presents a credible risk of harm to your children. An example of a credible risk of harm would be that Mom’s new boyfriend drinks and the children have been in the car when he has been driving drunk. The Court and Family Law Attorneys are interested in protecting the safety of the children at all times. A parent in this situation should be able to go to Court and have an Order put in place that prevents this person from driving the children. It is important to note, however, that such an order may be difficult to obtain because it must be proven that the children’s safety is in jeopardy. Potentially, a better way to resolve a highly contentious situation like this, is through mediation. Both parents would sit down and voice their concerns and work out a plan that works for everyone with the guidance of a trained mediator. Yet, another option would be family counseling that focuses on identifying non-hostile resolution to concerns following a divorce. On a personal level, I encourage most of my clients to wait a period of time before they begin dating. I believe they often deserve this time because the divorce is hard on them and everyone in the family. As your children are working through the emotions of a divorce it can be far more complicated for them to be introduced to someone new right away. Not everyone chooses to wait and if your ex-spouse falls into this category, then the best thing you can do is make the new person your ally. I have talked often of the importance of getting along with your ex and their family. This not only benefits you but is beneficial to your kids. They are going to be spending time with the new person and it makes it extremely difficult if you are throwing up roadblocks and stating that you hate the new “friend”. You may feel this way but it is best to let them make their own decisions and it is important they still have a relationship with the other parent. View the new friend as one more resource for your children if you can. None of this is easy and it takes time and energy, but your children are watching and they need you to take the high road. I am often asked if the new friend’s income is factored into how you calculate child support. Child Support, like many other specifics in a divorce, depend on all the facts of the case and each situation warrants review. Should you have questions, you should contact an experienced family law attorney for a consultation. Family law attorneys are here to advise even after the divorce papers are finished, especially if you have concerns about your children being in danger. Previous Post: Summer Vacation is just around the corner. . . .